- Enjoy a day at the pool. - Go for a game drive. - Go horse riding amongst the African game. 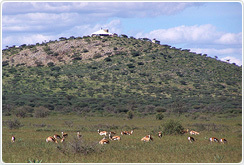 - Go to Windhoek for shopping and sightseeing. - Go for a walk through nature; we have four walking trails that you can choose from. - Read and relax while you enjoy the views. - Watch the daily farming activities, such as cattle & game farming and Friesian breeding.